(Nanowerk News) The inspiration behind NASA scientist Maxim Markevitch's quest to build a highly specialized X-ray mirror using a never-before-tried technique comes from an unusual source: a roll of Scotch® tape. Markevitch and a team of X-ray optics experts at NASA's Goddard Space Flight Center in Greenbelt, Md., have begun investigating the feasibility of fashioning a low-cost mirror from plastic tape and tightly rolling it like the sticky adhesive commonly found in most homes and offices. "I remember looking at a roll of Scotch tape and thinking, 'was it possible to use the same design for capturing hard X-rays,'" Markevitch recalled. "I talked with a few people, and to my surprise, they didn't see any principal reasons why it couldn't be done." With funding from NASA's Center Innovation Fund, the team now is pursuing Markevitch's "early-stage" idea and has already begun testing candidate materials that could be fashioned into a rolled mirror capable of collecting X-rays — in itself a challenging proposition. To capture these ever-elusive photons, the mirrors must be curved and nested inside a cylindrical optical assembly. The rounded geometry allows the high-energy light to graze their surfaces, much like a stone skimming the surface of a pond. 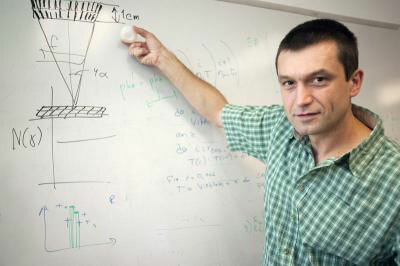 Principal Investigator Maxim Markevitch is using R&:D funding to pursue the feasibility of fashioning a low-cost X-ray mirror from plastic tape and tightly rolling it like the sticky adhesive ubiquitous in most homes and offices. The whiteboard drawing shows the shape of the X-ray mirror roll. Motivating Markevitch is the fact that these highly specialized mirrors are time-consuming and expensive to build and assemble, despite efforts to dramatically reduce production costs. Making matters more demanding is the fact that X-ray observatories in the future likely will require much larger collecting areas, therefore requiring an even greater number of individual mirror segments that all must be nested, coated with layers of highly reflective materials, and perfectly coaligned inside their optical assemblies. "It's a lot of work fabricating these rigid shells and making sure they're properly aligned," he said. The science Markevitch would like to pursue is one that would require a larger mirror. Over the past few decades, NASA has launched several X-ray observatories sensitive to lower-energy "soft X-rays," including the Chandra X-ray Observatory. They discovered and imaged the faint, diffuse X-ray signal from a variety of astrophysical sources dominated by thermal emission, such as galaxies and clusters of galaxies. Other missions, like NASA's Swift satellite, were sensitive to higher-energy gamma rays, but they lacked imaging capabilities. "There remains a large and totally unexplored discovery space of faint, diffuse nonthermal astrophysical objects emitting at high X-ray energies," Markevitch said. One class of objects waiting to be better understood is cosmic rays — highly energetic subatomic particles generated in deep space — that reside in galaxy clusters and other large-scale structure in the universe. Scientists believe that cosmic rays and the magnetic fields between galaxy clusters can alter the physics within galaxy clusters. A better understanding of these physics could reveal more about the birth and evolution of the cosmos, Markevitch said. To study cosmic rays, however, observatories would have to be tuned to hard X-rays. Although NASA's recently launched Nuclear Spectroscopic Telescope Array (NuSTAR) and Japan's New X-ray Telescope, also known as Astro-H, are sensitive to hard X-rays, Markevitch said they only "will graze the surface of this discovery space." Because the signal is so faint, only an imaging X-ray telescope with a collecting area 30 times larger than that of NuSTAR, working with current and future radio telescopes, could do the job, Markevitch said. "However, to our knowledge, nothing of the kind is planned or even proposed in the U.S. or elsewhere because of the cost something like this presents," he said. The only solution then is developing a new technology that would dramatically reduce the cost of building X-ray optics and increase the size of the light-collecting area. "If we can build a mirror that's big enough, this might be the way to go," he said. Under his research plan, Markevitch, Takashi Okajima, Will Zhang, and Peter Serlemitsos are acquiring and testing candidate tape that would be coated on one side with a multilayer of reflective material and then wound into a roll, forming a large number of densely packed nested shells that are spaced by the varying thickness of the tape. "The collecting surface is automatic, it's rolled, self-supporting, and already aligned," Markevitch said. Multiple rolls then would be placed in an optical assembly, providing a much larger collecting area, or, in other words, a larger mirror. "Maxim's Scotch tape idea is in an early stage," Zhang said. "In the next year, we will know whether it has a chance of working." If it does, it could prove "game-changing for hard X-ray astronomy," Markevitch said. "It could significantly reduce the cost of building large mirrors, bringing within reach the possibility of building a mirror with 10 to 30 times greater effective area than current X-ray telescopes."